Provide comfort for the family of Ann Wochomurka with a meaningful gesture of sympathy. Ann R. Wochomurka, 84, of Bloomfield, formerly of Simsbury, passed away, Thursday, December 6, 2018 at her home in Bloomfield. Ann was the beloved wife of the late Donald L. Wochomurka. She was born, April 7, 1934 in New Haven, CT.
She is survived by her children; Mary W. Cole and her husband Randall of Granby, Donald L. Wochomurka, Jr., of Bloomfield, Sally W. Griffin and her husband Stephen of Unionville, and Cynthia W. Mazzarella and her husband Charles of Watertown. She also leaves behind her grandchildren; Timothy and Katherine Wochomurka, Eric Cole, Sara and Stephanie Griffin, Charles and Allison Mazzarella, as well as two great grandchildren, Nathaniel and Rose Marie. 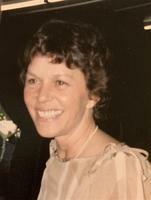 She also leaves behind her brother and sister-in-law, Robert and Janet Rosadini as well as numerous nieces and nephews. Funeral services will be private at her request. Arrangements provided by the Vincent Funeral Home of Simsbury. Please visit Ann’s “Book of Memories” at www.vincentfuneralhome.com for online condolences. Provide comfort for the family of Ann R. Wochomurka (Rosadini) by sending flowers. My deepest condolences to the family at this difficult time. I hope the words at Rev.21:4 bring you comfort. It says: "God will wipe out every tear from their eyes,and death will be no more,neither will mourning nor outcry nor pain be anymore. The former things have passed away.” Please know you are in my thoughts and prayers.